An excellent work of historical fiction! My thanks to my contacts at Pegasus Books, Iris Blasi, Katie McGuire, Maia Larson, and Bowen Dunnan for my review copy of this book. You guys rock! The book opens with an account of the 1898 assassination of Empress Elizabeth of Austria. The case is investigated by Detective Inspector Oskar Reinhardt. The Detective consults with an old friend and alienist, Doctor Max Liebermann. Liebermann is a student of Sigmund Freud. Together Reinhardt and Liebermann investigate, interrogate suspects, and try to make their findings sure by use of the latest in criminal science. 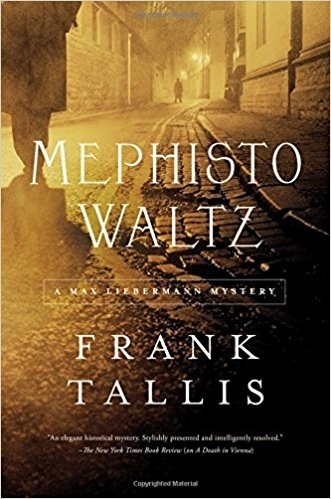 I found it very neat how Tallis works period crime-solving methods into the story. Fingerprints are just beginning to be accepted as unimpeachable evidence. There is also an account of what might be the first attempt at a lie detector. I also liked the interludes when the investigators, hot on the trail, would take a break to sing and play music. In a rush to examine a crime scene, they have time to savor a delicious sausage from a street vendor. This brings a note of humanity to people who must deal with the blood and horror of murder scenes. They are tiny moments stolen from the hue and cry of criminal investigation. The author stays true to historical events while skillfully wording his tale to maximize reading pleasure. I must say that reading this book got me to searching the Internet for the historical references! Though the book ends before the war starts, the anarchists' plans will ultimately be the catalyst that will spark the war to end all wars, WWI. This is absolutely the finest piece of historical fiction I have recently read! The plot is sound, the pacing swift, and the characters complex and engaging. All in all, this was a terrific reading experience! I give this book five stars plus!